LAS VEGAS, July 19, 2018 /CNW/ – Planet 13 Holdings Inc. (CSE: PLTH) (“Planet 13” or the “Company”), a leading vertically-integrated Nevada cannabis company announced today the official groundbreaking at its Planet 13 Superstore. Anticipated to be among the world’s largest cannabis dispensaries, Planet 13 Superstore will offer visitors from around the globe a unique experience when the destination opens in November 2018. Planet 13 Superstore will be located at 2548 W. Desert Inn Rd., only a few steps away from the famed Las Vegas Strip. Brought to life by Co-CEOs Robert Groesbeck and Larry Scheffler, the new entertainment complex will be unveiled in phases, with the first phase to be completed and open to the public in November 2018. Phase 1 will be more than 40,000 square feet and includes a multi-faceted entertainment space featuring interactive attractions and more than 16,500 square feet of cannabis retail space. The new destination will weave together an unparalleled dispensary experience, complete with 45-50 registers to serve the large number of anticipated visitors with state-of-the-art technology and interactive entertainment. As guests approach the complex they will be greeted by 13, 15-foot-tall LED lotus flowers on the roof of the building. Made of acrylic leaves and metal stems, the lotus flowers can be controlled by visitors, making them interactive pieces of art. The control panels will be located near the sophisticated outdoor water feature that is branded Planet 13. 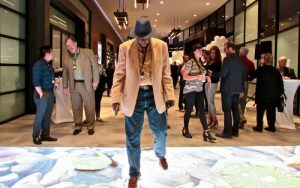 Customers can explore these features before heading into the lobby where they can experience the sensory-activated LED flooring that creates an interactive show while guests are walking on it. The attractions continue once guests move inside the main portion of the complex where they’ll view a glowing aerial orb show high above the dispensary floor. There’s also interactive laser graffiti where visitors can leave their mark with unique writings and drawings. Guests also will be mesmerized by the 3D Projection Visual Experience where numerous 3D visuals are projected onto walls.